I look comfortable and relaxed, don’t I? Guess what I saw today? I saw two bags holding yellow color platelets. I felt the warmth of an electric blanket and the softness of a padded chair. I heard the care of a technicians voice, concerned for my every need and whim. I tasted yummy oatmeal raisin cookies.And I felt the emotion of unworthiness. I’ve donated blood several times but this was my first time to donate platelets. 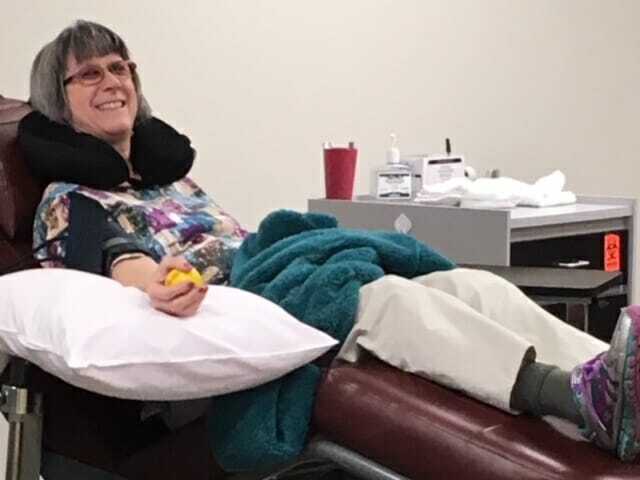 Recently, spurred on by a national shortage of blood and impressed with my high-profile veins, the blood donor staff encouraged me to take the test for platelet donation. The test results showed I have an extremely high level of platelets; would I donate? Can I say they begged? Platelets donation is a lot more involved than blood donation. The process takes about two hours. The donor is hooked up to a computer and other machinery that draws blood out, separates the platelets from the red blood cells, and then returns the red blood cells back into the body. Platelets are used for cancer patients and some surgical procedures, helping to prevent massive blood loss. You can read more about platelet donation here. It became a cushy experience. The tech encouraged me to tell her if anything bothered me. I tried to explain that as a writer, I might make comments on my observations, but it wasn’t complaining. I guess she didn’t get the memo. As soon as I commented about a tingling around my mouth, she whipped out a bottle of Tums and dialed down the saline solution dripping into my arm. The tingling was a common side effect, but for some crazy reason, Tums reduces the sensation. It did. Could she get anything for me? Water? Juice? Snacks? At first, I accepted a bottle of water, but she persisted. I agreed to some apple juice and one oatmeal cookie. She brought me four large luscious cookies. She replenished my half empty juice cup. At the mention of one hand becoming cold (another common effect), she produced a chemical pack that warmed my hand. Apple juice. Cookies. Comfy chair. Warm blanket. Gratitude for my time and donation. All Jesus got was vinegar. Instead of a neck pillow, he got a backboard of splintered wood. Gratitude would come later; for that moment, all he received were barbed comments from his oppressors and abandonment from his closest friends. And I had the audacity to cry when my husband told me last minute he was too busy to take me to my appointment. Some willing tenacious sufferer I am! That stack of cookies didn’t look so appealing anymore. 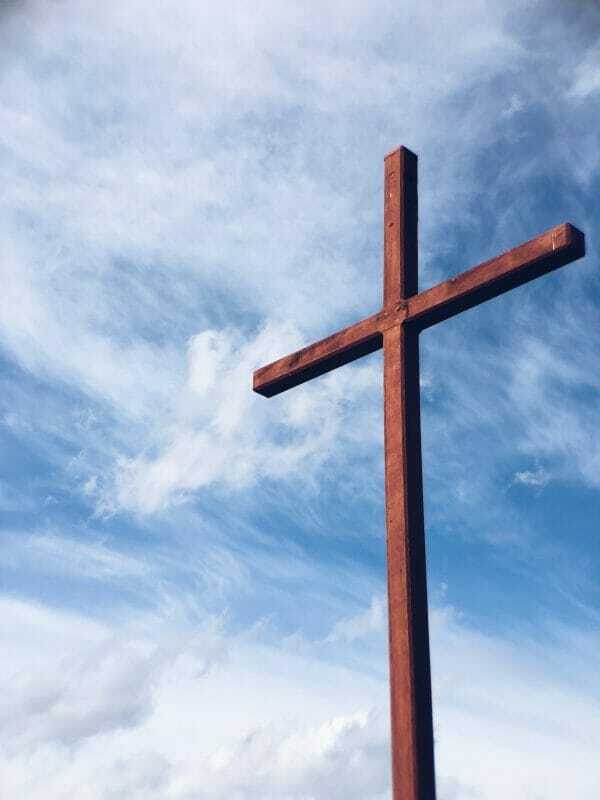 Jesus’ blood: donation or sacrifice? Jesus and I both gave our life blood to give life to others. I got mine back. I was in a sterile, comfortable environment where everyone lauded my generosity. Jesus gave his to the point of death and to the point of pain, agonizing pain, getting sympathy, gratitude, or understanding from no one for what He was trying to do. My blood will help save one life. His blood saves all who put their trust in Him. “Thank you for coming in today,” my tech told me for about the third time. What could I say? Telling her it was my pleasure and privilege sounded so trite. Two hours of laying around drinking apple juice and scarfing oatmeal cookies? Lounging about the rest of the day, reading, napping and telling my husband he had to take out the dog because I wasn’t supposed to lift or exert too much? I didn’t begin to know the meaning of the word sacrifice. I walked away feeling so small, that my service was a mere drop compared to the life flow my Savior gave for me. As I reflected on His gift of life-blood, I felt so unworthy, yet so loved. Mine was a donation. His was a sacrifice. He gave his all. If you are interested in donating blood, platelets, or plasma, contact your nearest Red Cross location. For those of you in the Missouri, Illinois and Iowa Region, check out the Mississippi Valley Regional Blood Center for a center or mobile unit near you.